My grandpa Gilflurt likes a bit of sport and always has the time for cricket. Another man who liked the sound of leather on willow was our own Frederick, Prince of Wales, and in honour of his birthday today, I thought I would share the tale of his love of the game. 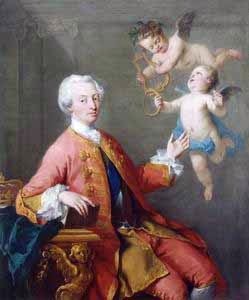 Frederick arrived in England from his home in Hanover at the age of 21 to join his mother and father, George II and Caroline of Ansbach, with whom he had a relationship that can politely be described as fraught and, less politely, downright hostile. A keen sportsman who was looking for some way to fit into his adopted country, Frederick turned his eye to cricket and soon found it very much to his taste. The young man threw himself into his new interest, learning all he could about the game and happily gambling on matches along with his fellow enthusiasts. He was soon something of an expert on the sport and was often in attendance at matches, making friends among the players and followers of the game. Eventually Frederick's spectator interest began to develop into a wish to do more than just watch the game and on 28th September 1731 he took up the bat on Kennington Common to take part in a Surrey versus London match. No record exists of the Prince's performance, but his appearance was sufficiently novel to be reported in the advertisements for the match and his appearance at other games was documented by the popular press. By 1733 Frederick was an avowed cricket fanatic. Often on hand to present prizes to winning teams, he also awarded players from his own pocket now and again and formed his own team, the Prince of Wales' XI, for competitive and recreational matches. His enthusiasm never dimmed and he captained the team with enthusiasm and passion, watching from the sidelines when not actually playing on the field. There was to be a dark twist to the Prince's love of the game though and popular gossip claimed that it was cricket that eventually caused Frederick's early death and that a cricket ball had struck him in the chest and caused the abscess that killed him. Whether a cricket ball struck the fatal blow is debatable but one thing is for sure and that is the fact that the Prince of Wales loved cricket to his dying day and on his death the practitioners of the game honoured him in turn, playing games dedicated to the memory of their regal patron. Fascinating,Madame! Thank you for sharing! Obviously his gutteral accent didn't hold him back? Certainly not on the cricket field! He did love his sports!